We were worried that fishing would be slow after the storm passed, but fishing jumped right back in. 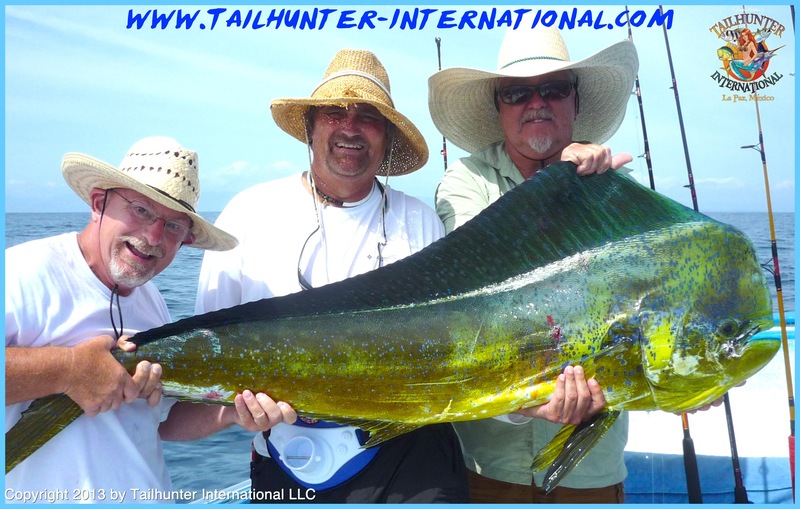 Showing off a day’s catch with our Tailhunter La Paz fleet, George Higi, Will Klem, George Higi III and Will Klem Sr. strike a great pose with their dorado! Yes! 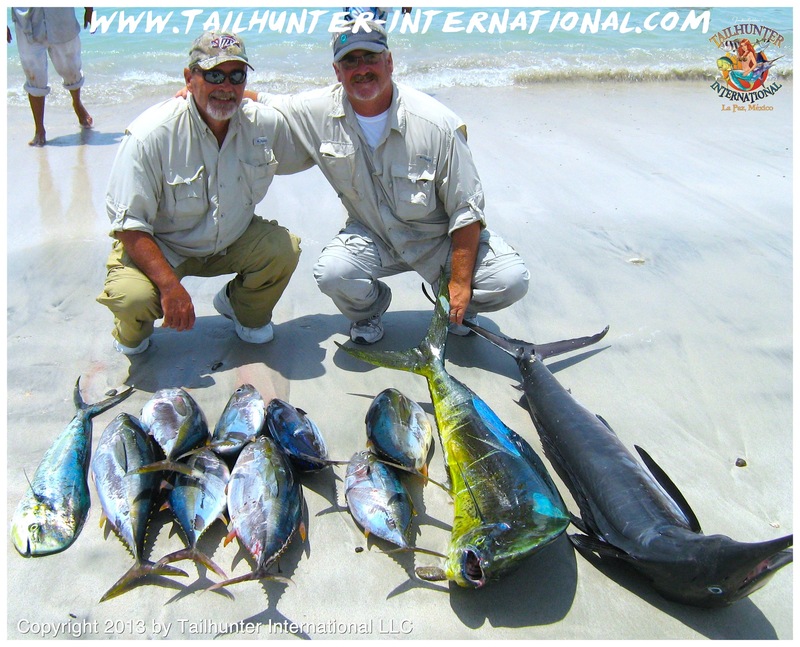 Those are yellowfin tuna on the sand here with Steve Moratto and Rob Barton from Santa Rosa CA who squeezed in one-day of fishing with our Tailhunter Las Arenas fleet and had a super day with yellowfin tuna, dorado and a striped marlin that they tried to revive but were unsuccessful. 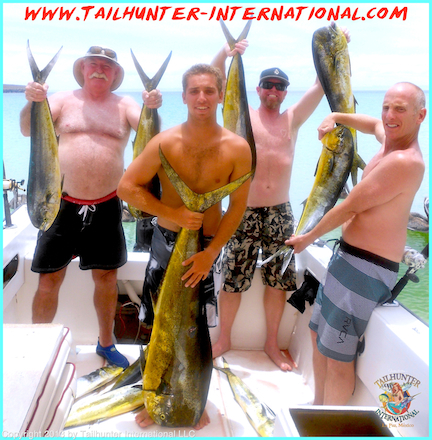 The tuna popped up and were crashing for several days with all fish being about 10-20 pounders. It’s been awhile since the tuna have been this thick. I can’t get a straight answer from my Kansas amigos as to who actually caught this fish, but it’s a beauty. Allen, Clarence and Josh all posed with it and did some pretty good fishing over the week they were here. From Diamond Bar CA, Bill Hsu has been a Tailhunter amigo for many years. 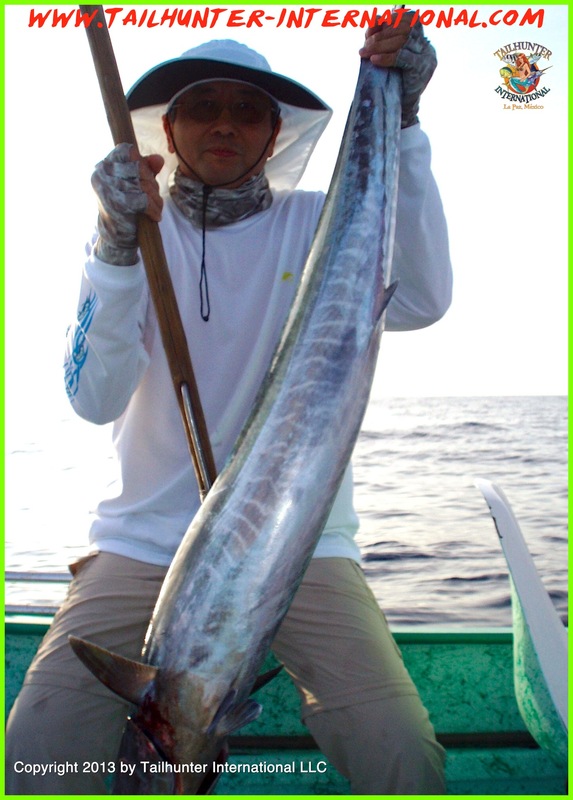 But, everytime he comes down everyone else catches the wahoo except him. He made up for it with this one he caught with Captain Archangel off the south end of Cerralvo Island and also had another nice fish come unbuttoned. 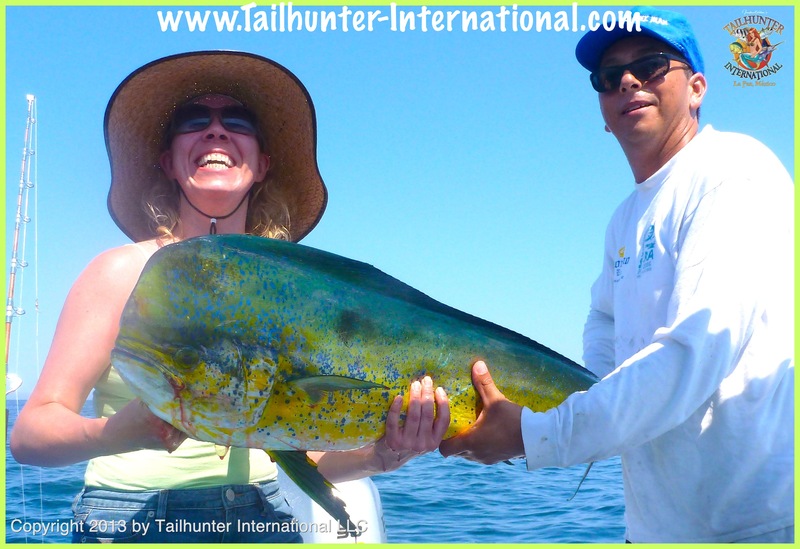 “Happy Girl!” Becky Csutoras had the best fishing trip ever with big dorado and several marlin releases. Becky is an avid hunter and fisherperson and lives near Sacramento. 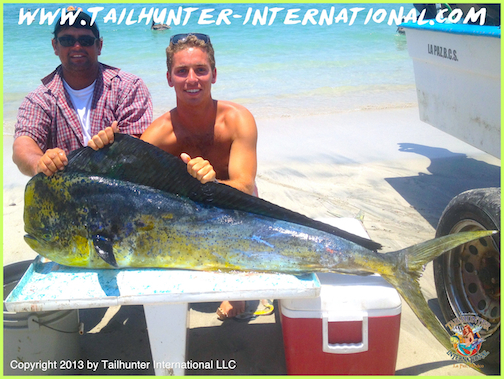 Captain Joel from our Tailhunter La Paz fleet helps out! 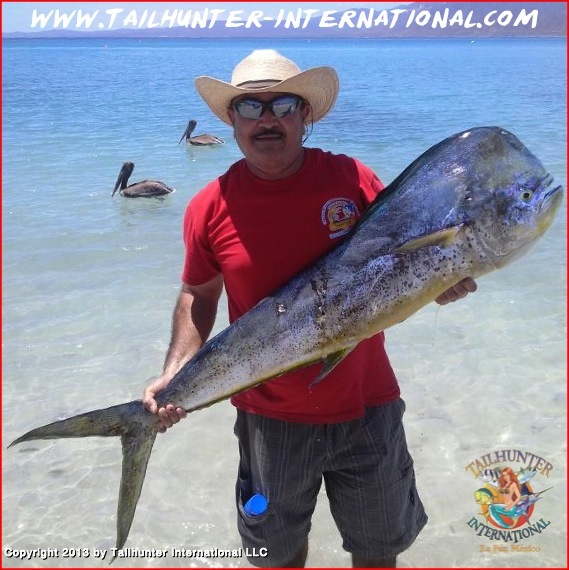 Unfortunately, because of the storm, long-time Tailhunter amigo, Sam Sybesma, only got to fish one day, but made the most of it with some great dorado fishing out’ve La Paz. He was fishing with Jeff Klassen. Their video with Captain Chito is below all this week’s photos. Check it out! He had the knack this past week for the big fish. Will Klem from El Segundo posted up a big bull dorado with Captain Armando from our Tailhunter Las Arenas fleet caught at the buoys. He’s always got the big smile for his photos. 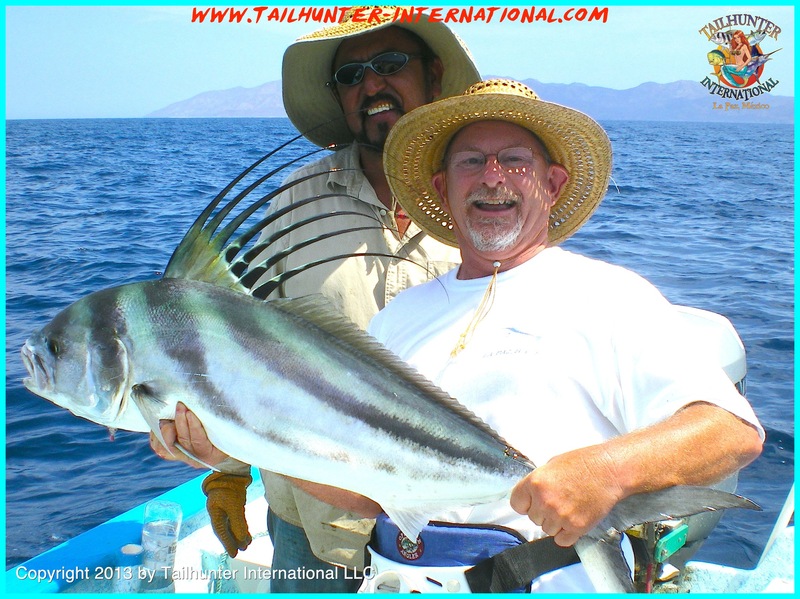 Allen Burgess from Kansas caught and released this nice roosterfish while Captain Jorge drove the panga. They were fishing near the Arenas lighthouse. Esteban Romero does his best vaquero cowboy look while standing with a nice bull dorado. Esteban is getting really good at getting into the fishing reports lately with some great fish. Several years ago, he didn’t even like fishing! Andale, amigo! 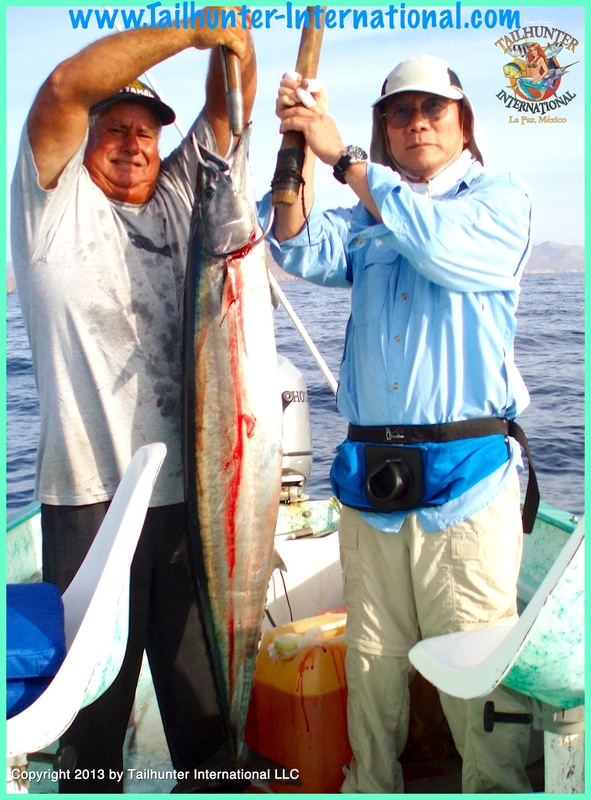 The photo isn’t very clear, but this is no doubt a big wahoo caught in the dim light of the early sunrise near Cerralvo Island by Stan Yung who was fishing with Captain Archangel. They hooked 3 wahoo this day but one got away. 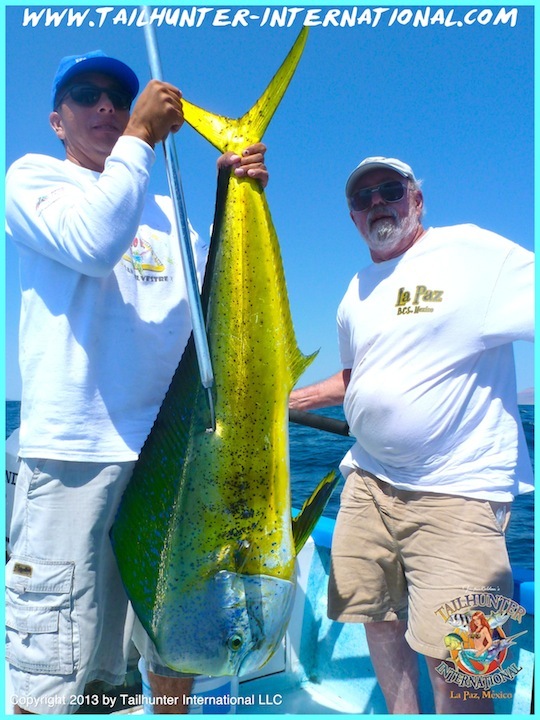 Jimmy Csutoras and Captain Joel show off another of Jimmy’s big dorado for the week. 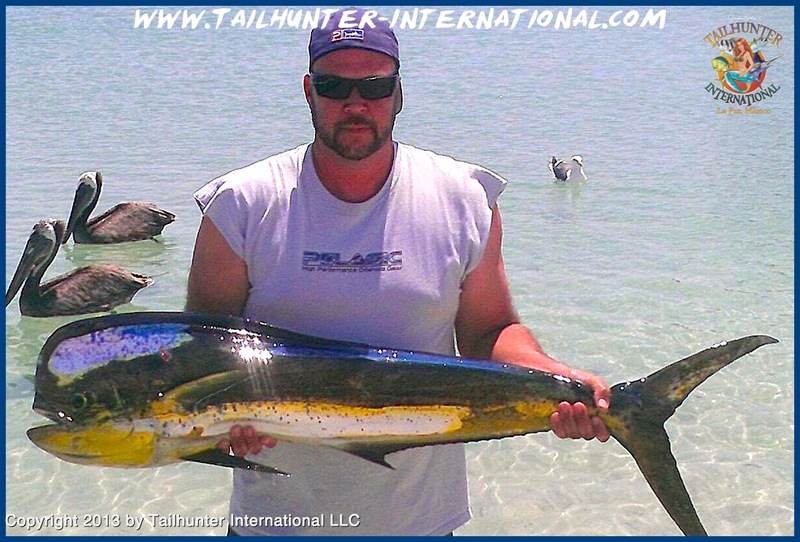 STORM PASSES AND FISHING RECOVERS NICELY WITH BILLS DORADO WAHOO & TUNA! Well, as it turned out, the storm blow off the west side of of Baja and into the Pacific. Some of the southern areas got some rain and winds, but for the most part, here in La Paz, all we got were some clouds. However, the storm did send some really big swells and chop our way and in one of the rare occasions, we canceled one day of fishing. It’s rare and we could have fished. But, we COULD have fished, but most of the fishermen had extra days to make up the day so there was no sense in sending out folks to be uncomfortable and get bounced around! It’s supposed to be fun right? And if they weren’t going to catch much fish, it seemed more logical to tell folks to hang at the pool and soak up some sunshine instead. So, that’s what everyone did. But, the downside to that is we never know how it’s going to be AFTER a storm. I am always worried that the waters can be turned over and dirty or cold water moves in or the fish are just plain skittish! Well, as it turned out, canceling the day was a good move! The fish came back strong right out of the chute! We got right back into a pretty solid dorado bite for our Las Arenas and La Paz fleet with some nice 30-40 pound fish. La Paz had the better dorado bite out of the two areas with some nice patches of bull dorado. But, there were some hot spots out at the 88 east of Cerralvo and at the shark buoys off Las Arenas for the nicer bulls. Wahoo popped up on the south end of Cerralvo and we had some biters each day. Dark Rapalas and Yo-Zuris trolled over the high spots were the ticket but also strangely mackerel-colored patterns also worked. Additionally, hey…we finally got tuna!!! Football tuna in the 10-20 pound class made for some great action not too far offshore Punta Perrico and Cerralvo Island. Some pangas took limits of the flashing footballs in short order. Several of our anglers said that slow trolling Cedar Plugs and dark feathers resulted in instant hook-ups. Hopefully, this bite is just the vanguard of us finally getting into a lengthy tuna bite as we didn’t have any tuna to speak-of, last season! Also, maybe the larger models will also show up! The other fun even was the billfish. As one of our guys told me, “Jonathan, I’ve never seen anything like it! There were sailfish and marlin literally JUMPING out of the water around the panga!” There were several days here this past week where every one of our pangas hooked at least one billfish but somedays where some of the boats hooked 2-4 billfish! Most of the billfish were 60-120 pounds with some larger and almost all of them were released! The fish are not very far offshore and I would recommend that anyone coming down bring some marlin feathers. One color that seems really hot is a green and yellow that looks like a small baby dorado because there’s a ton of baby dorado in the waters…little itty-bitty 10-inch dorado that are like candy for some of the larger fish and even the monster dorado are also chasing the babies! Food is food, I guess! But, if you want to troll, bring 2 dark colored feathers and 2 light colored lures. We Love reading reports and sharing the stoke on fish caught, but we would also love if the limits were respected. It seems at least on the two first pics of this week that there is more fish than what should be. I know its easy to get carried away with all this exitement and life in the water, and i am not a green hippy ecofreak, just thinking of the same situations in their countries of origin and the RESPONSABILITY that a company like Tailhunter has to abide by the laws and respect at least the legal limits. Good eye, and, if you read the fishing reports often, you rarely see me post photos of stacks of dead fish! I agree with you about the limits. In both of those photos…the 1st one was actually the catch of 2 pangas together and 6 guys…(two of them not pictured). In the 2nd photo, there were also 2 more guys who weren’t pictured.